Taylor Swift's Attorney Rebuked Over Letter Demanding Article's Retraction : The Two-Way The lawyer accuses a small website of defaming Swift. The American Civil Liberties Union accuses Swift's team of legal overreach. The article in question argues that by not tacitly embracing progressive politics, Taylor Swift "could well be construed as her lending support to the voices rising against embracing diversity and inclusion emblematic of Trump supporters." 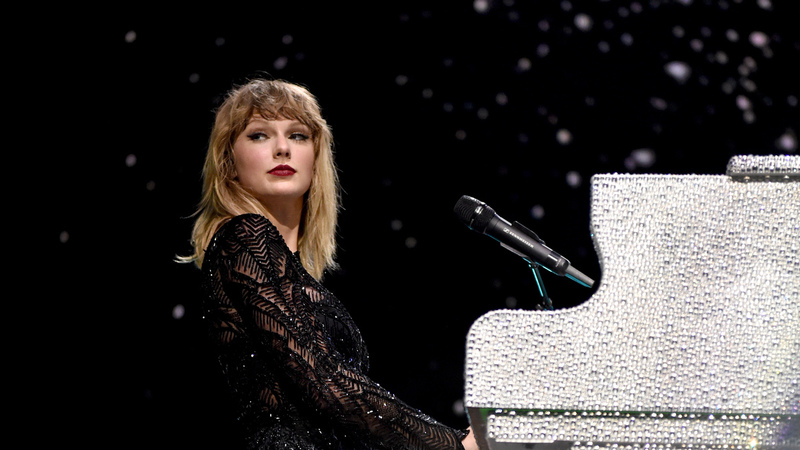 Just four days before the release of her newest album, a letter from Taylor Swift's attorney demanding that a website retract and delete an article critical of her has drawn a sharp (but also winking) rebuke from the American Civil Liberties Union. A letter dated Oct. 25 and addressed to Meghan Herning, the executive editor of a small California blog named PopFront, claimed that the site's article titled "Swiftly to the alt-right: Taylor subtly gets the lower case kkk in formation" was defamatory and that if it was not retracted and removed, "Ms. Swift is prepared to proceed with litigation," according to a copy of it made public by the ACLU. The article in question — which veers between Kanye West's interruption of Swift at an awards show, the appropriation of Swift by white nationalists, the eugenics movement of the early 20th century, World War II and American silence toward the Nazi Party, and the lyrics of Swift's recent single "Look What You Made Me Do" — ultimately argues that Swift's perceived silence on political issues "is not innocent, it is calculated." The article argues that by not tacitly embracing progressive politics, Swift "could well be construed as her lending support to the voices rising against embracing diversity and inclusion emblematic of Trump supporters." The article's rhetorical veracity is not the point for the ACLU, however — only that PopFront was stating an opinion about Swift, not asserting any facts. In its response, the ACLU of Northern California writes that "Ms. Herning and PopFront will not in any way accede" to the demands. Swift is a public figure — as the ACLU explains — a designation that gives critics and journalists broad protections in what they can legally write about those figures. Anyone suing for defamation on behalf of a public figure must prove both that the writer whom they're suing published false information and was aware beforehand it was false and published it anyway. In addition, opinion is, by definition, not defamation. The ACLU writes that Briggs' letter, a "threat" according to PopFront, does not convincingly argue that the blog purposefully defamed Swift. "Criticism is never pleasant, but a celebrity has to shake it off, even if the critique may damage her reputation," reads the ACLU's letter — shoehorning in two references to Swift's upcoming album Reputation and her 2014 hit "Shake It Off," in a single sentence. In his letter, Briggs points to two instances that seem to undercut any connection between Swift and far-right political movements. He refers to a Washington Post story without any Swift comment that says there is no reason to think she is a neo-Nazi; he also quotes one of Swift's lawyers as saying it was safe to say "the singer is not amused" by the allegations. Briggs' cease-and-desist itself could possibly be taken as a third denial. In a PopFront post on Monday, both Broadly, a Vice vertical "devoted to representing the multiplicity of women's experiences," and Complex Media were cited as publishing similar articles addressing the alt-right's appropriation of Swift. Requests to both asking whether they had received similar letters from Swift's attorneys were not immediately returned. Reputation, Swift's sixth studio album, is out on Nov. 10.